Mr. O worked late tonight, so this dinner’s preparation was split, but all told, it’s still under twenty minutes, and nice to look at to boot. Really, the title says it all — just brown the kielbasa in a pan over medium heat, add the beans in the last few minutes of browning, and then toss the kale on top of the beans and kielbasa. Cover the pan to let the kale wilt for five minutes or so. Divide the kale between two plates (and one leftover container for lunch the next day), and spoon the kielbasa and beans over the greens. Slice the tomatoes, cube the feta, and divide between two plates. Add olives to taste, drizzle with olive oil, and wave the balsamic near the salad. Sprinkle with salt and pepper just before serving. 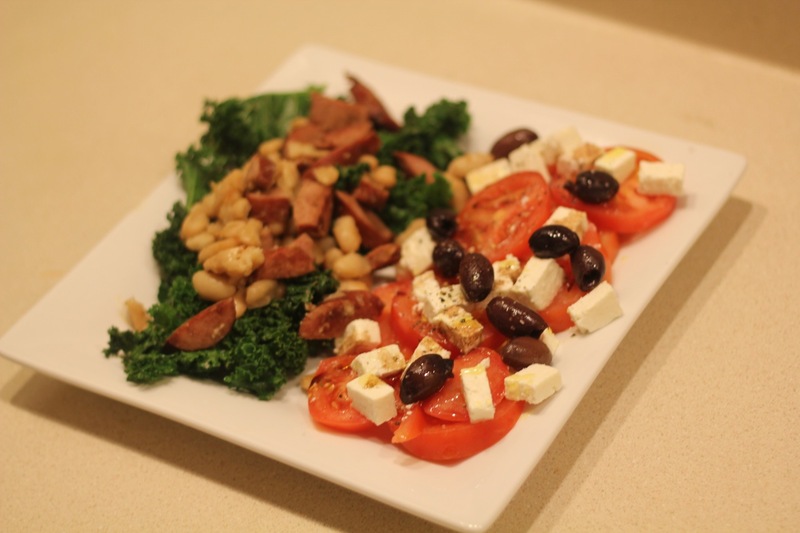 This entry was posted in Foodstuffs and tagged beans, Greek, kale, kielbasa, quick, recipes, salad, tomato. Bookmark the permalink.